I first met Steve Bauer at the 2015 Greenwich Concours. We bonded immediately and have been great friends ever since. 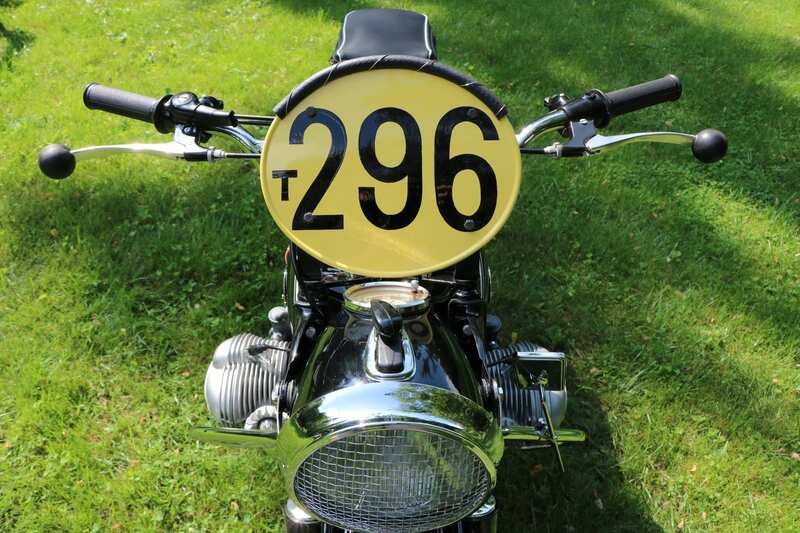 Our friendship began over our shared passion for BMW motorcycles and escalated when we realized our parallel views on perfection, authenticity, and factory-correct restorations. Our friendship has traveled coast to coast. 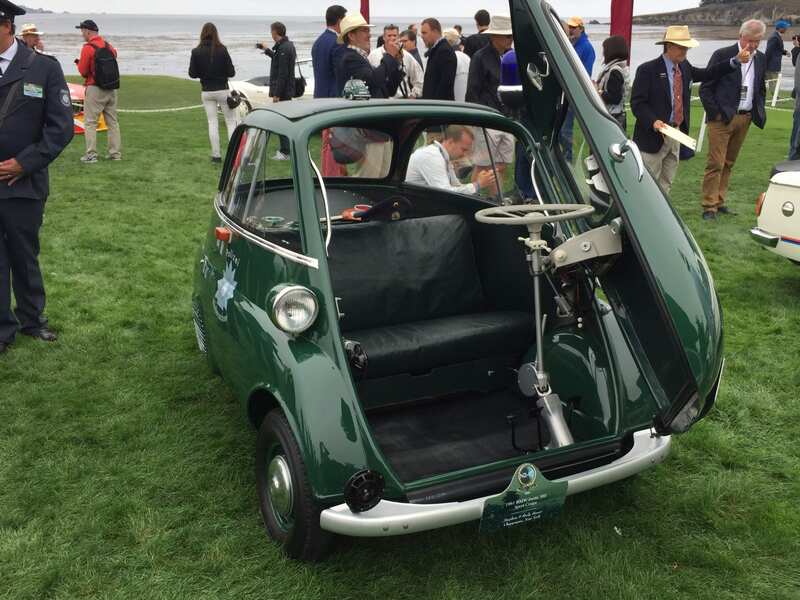 Last August, we met up in Monterey where Steve showed his incredible BMW “Polizei” Isetta. 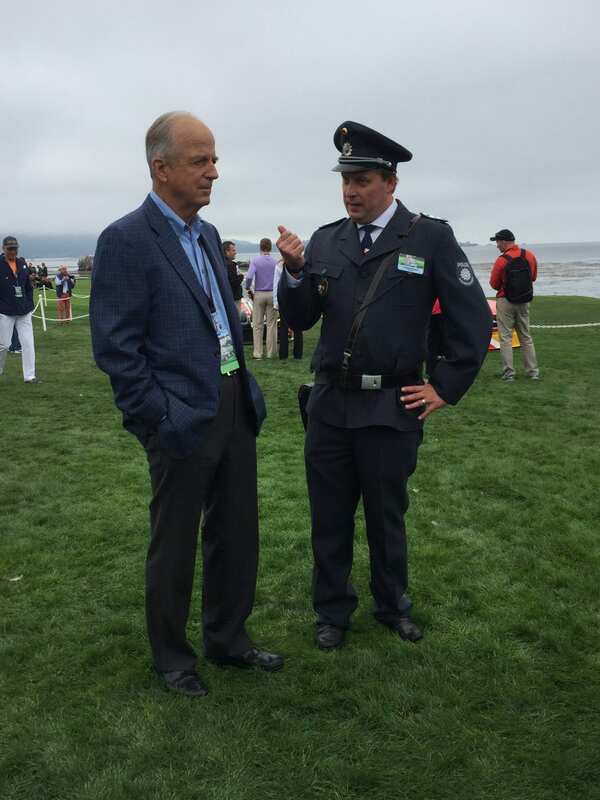 Steve stole the show by standing on the 18th hole of Pebble Beach in full post-war German police livery. 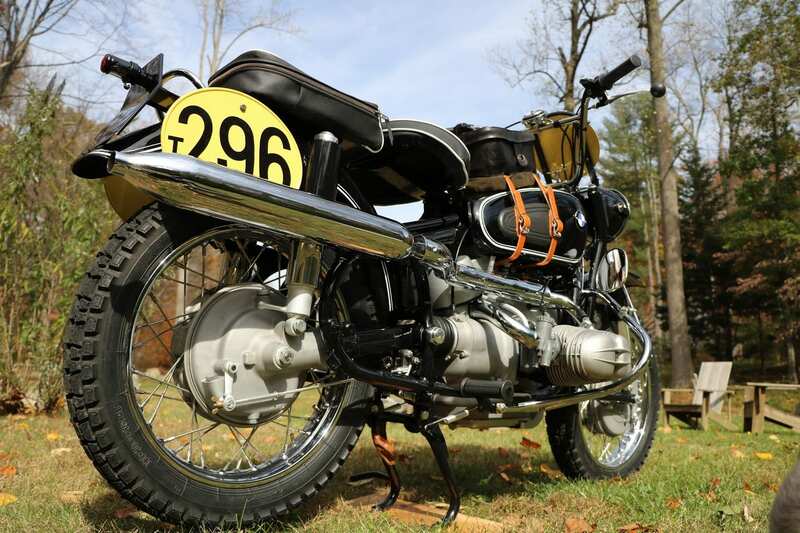 Recently he finished a multi-year project to build a totally authentic BMW R69S ISDT replica. The story that follows is Steve’s written summary of the entire project. Steve Bauer with Peter Ueberroth (owner of Pebble Beach golf course and former MLB commissioner) at the 2016 Pebble Beach show. 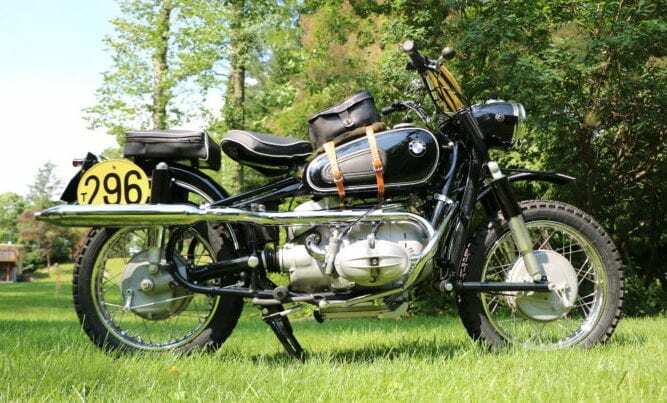 My journey with vintage BMW motorcycles began as a young man in 1994 on a coffee buying trip in the Tanzanian outback where I bought a dilapidated 1965 R27 painted “polizei” green. BMW Historical Archives confirmed it was originally used by the Hessen police, and I spent the next 20 years sourcing all the required rare and original accessories; lights, siren, antenna, radio, switches, bags and the all the required mounting hardware. It gave me a great appreciation for hard-to-find period accessories in general, and the hunt for them was great fun as I met such helpful and knowledgeable people. 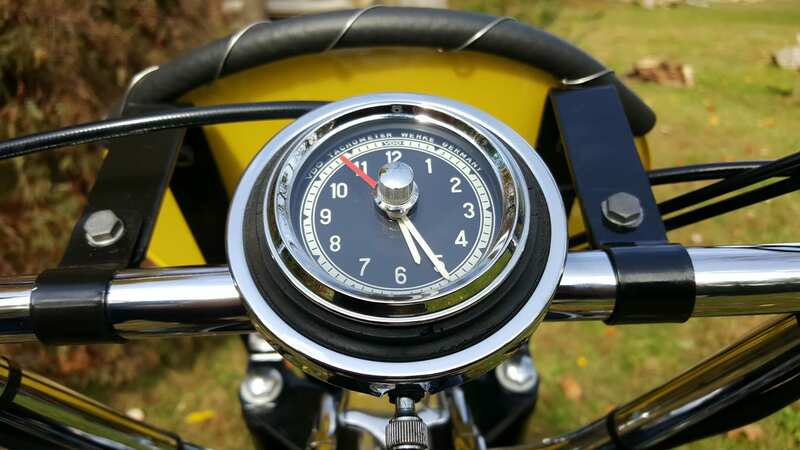 During that process I learned that perhaps the rarest BMW accessory of the /2 period was the VDO ISDT 8 Day Clock; a handlebar mounted wind up timepiece used by riders in the International Six Days Trial race, so named because at full wind it kept time for 8 days. Most of them were destroyed in crashes long ago, and their usefulness now past with the advent of technology. The simple rarity of them was too much for me, so after years on the hunt I was lucky enough to acquire one in poor condition and had it restored by retired watch-makers in Germany. It took a place on my shelf as a historical artifact to admire and show to friends. Too bad I didn’t have a vintage ISDT bike to put it on. Who would? I hadn’t even seen one. 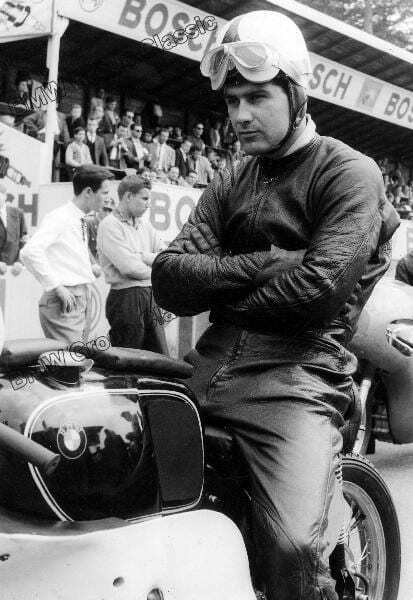 Several years later I came across a vintage photo of a unique BMW R69S that left me stunned. It was so heavily modified that nearly everything on it was non-stock. 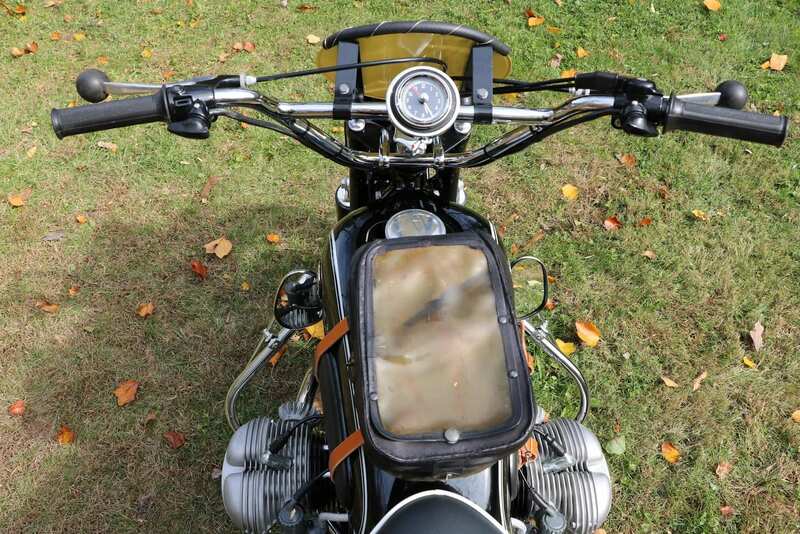 It had a two-in-one high exhaust system, super high handlebars, an oil pan skid plate, knobby tires, altered front and rear fenders, re-routed clutch cable and lever, Tommy bars through the axels, fender mounted tool bag, reinforced engine guards, and a headlamp lens grill. It even had a small air tank mounted to the frame! 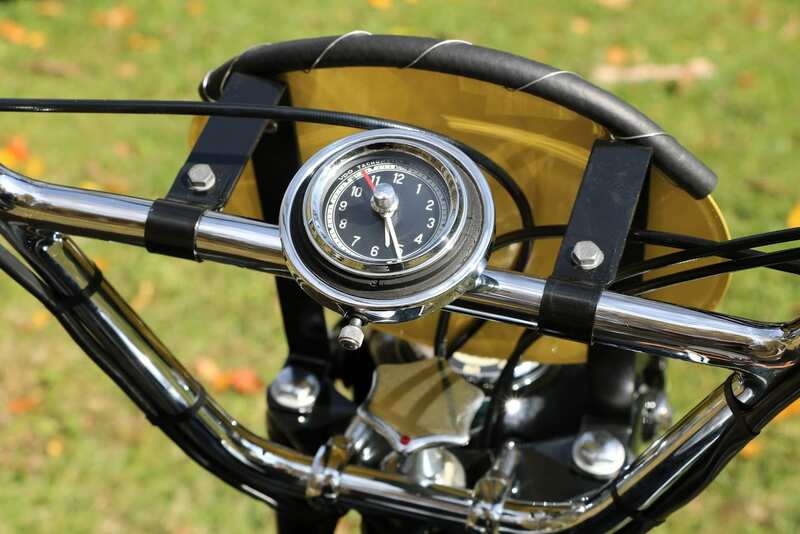 Then I spotted the hockey puck shaped thing in the middle of the handlebar crossbar; a VDO ISDT 8 Day Clock. 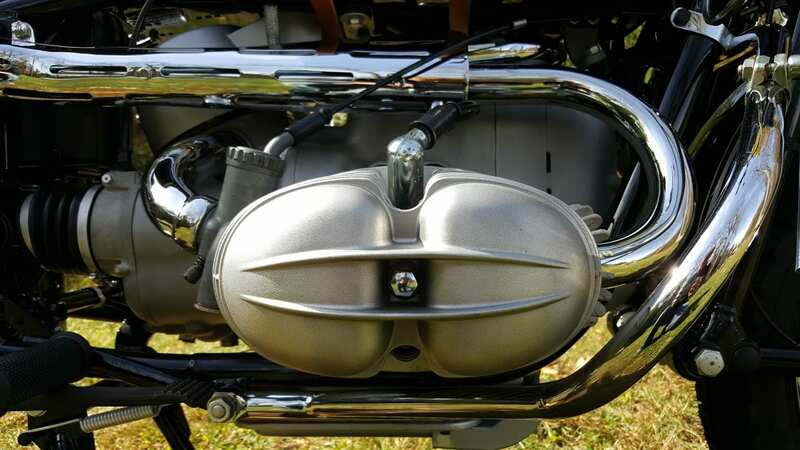 I did some research and learned, to my surprise, that was exactly how this motorcycle looked the day it rolled out of the BMW factory. 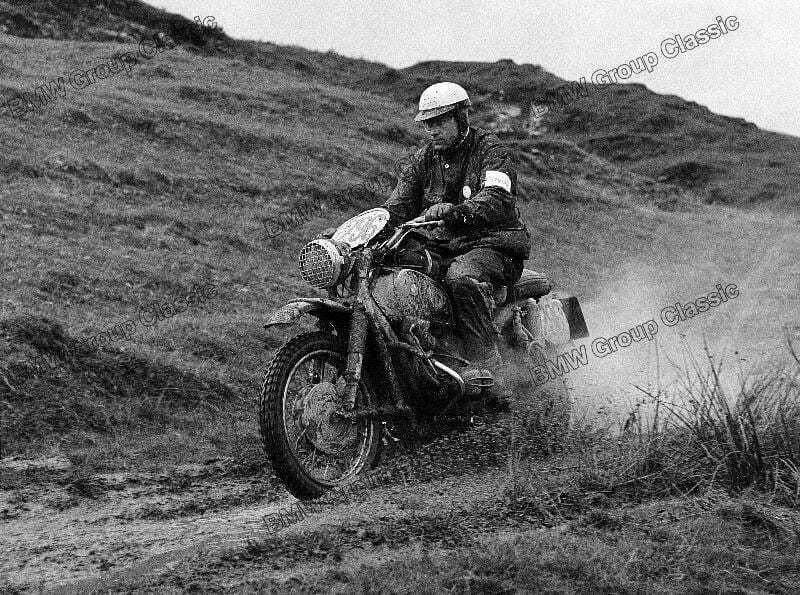 BMW had pulled their factory works riders from the road-racing solo classes in the 1950’s and was able put some effort into off-road activities. They had stiff competition at the time, even against other German marques like Zundapp, NSU, Maico and Hercules so they had to do something special. 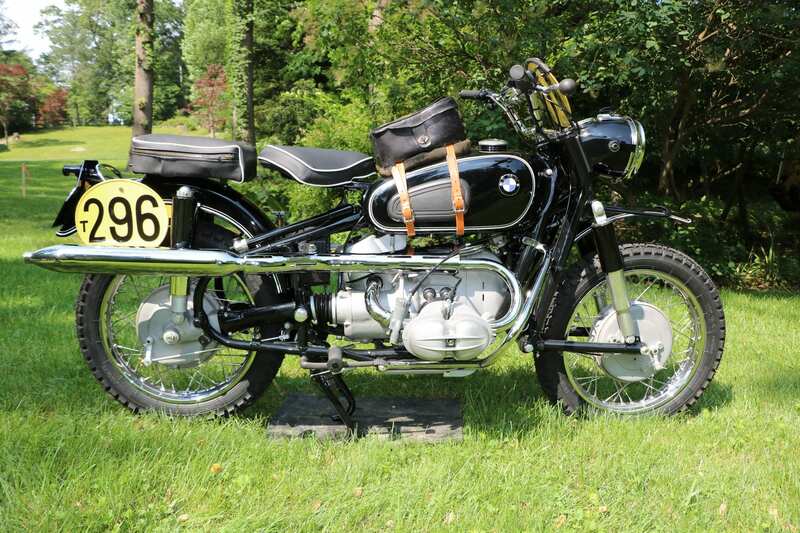 In 1960 the BMW factory works created a one of a kind enduro version of their new R69S sport model to race in the German Off-Road Championships and Inte-rnational Six Days Trial (ISDT); the Olympiad of motorcycle racing. It proved to be a winner. 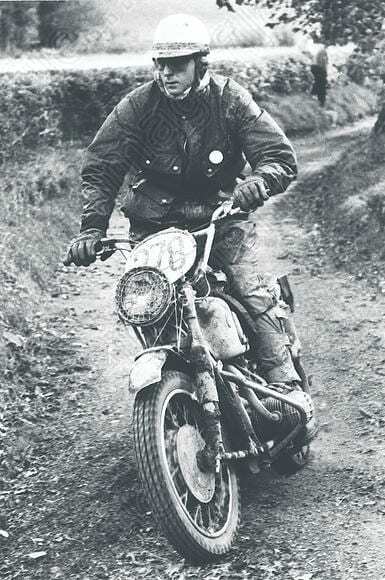 West German rider Sebastian Nachtmann rode it to victory in both the 1960 and 1961 German Off-Road Championships. It was no less successful in international competition. 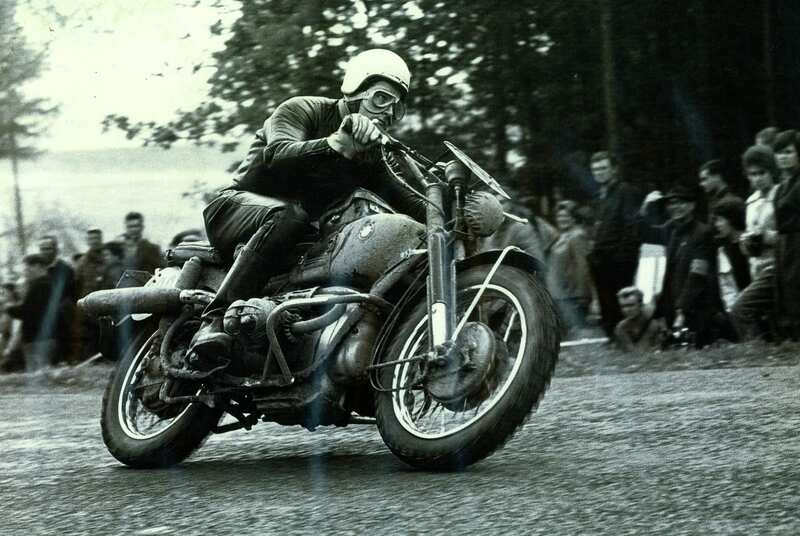 In the 1960 ISDT held in Bad Ausee, Austria, as rider #283 on the four-member West German Silver Vase Team B, Nachtmann garnered the highest point total among all 300 riders. It was one of only two BMW’s in the race, and the team had a good showing of third place. 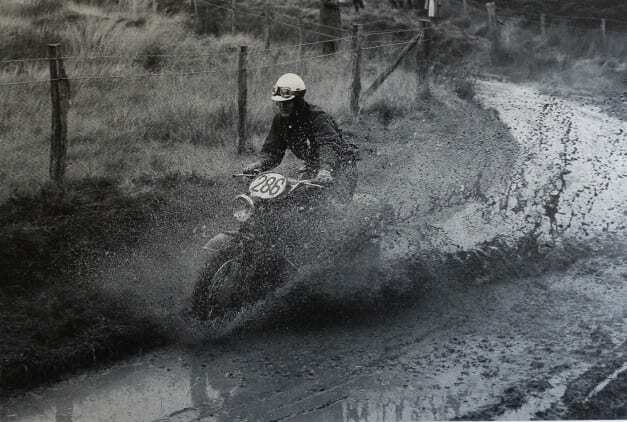 The following year at the 1961 ISDT held in Llandrindod, Wales, Nachtmann was part of the six-member West German International Trophy team as rider #296. 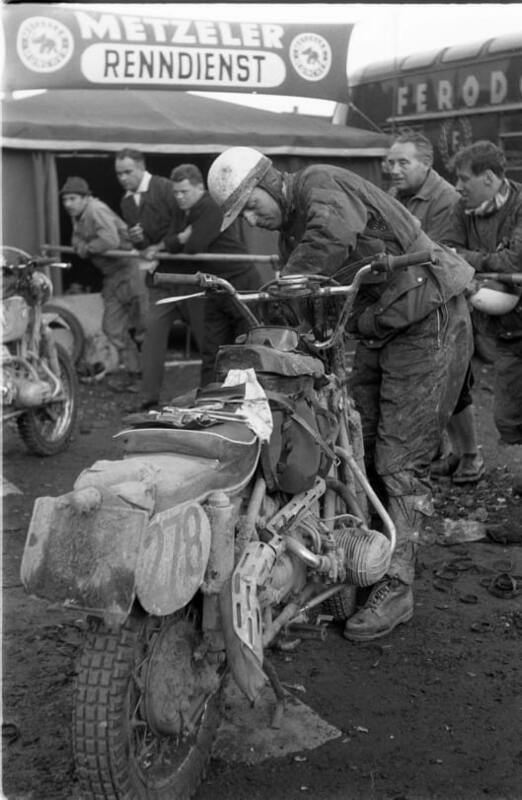 Each team required at least three classes of motorcycle, so the R69S filled the class over 500cc, and was the only BMW on the team with Zundapp, Hercules, NSU and Maico. He received the only Gold Medal in the class and his team won the International Trophy. 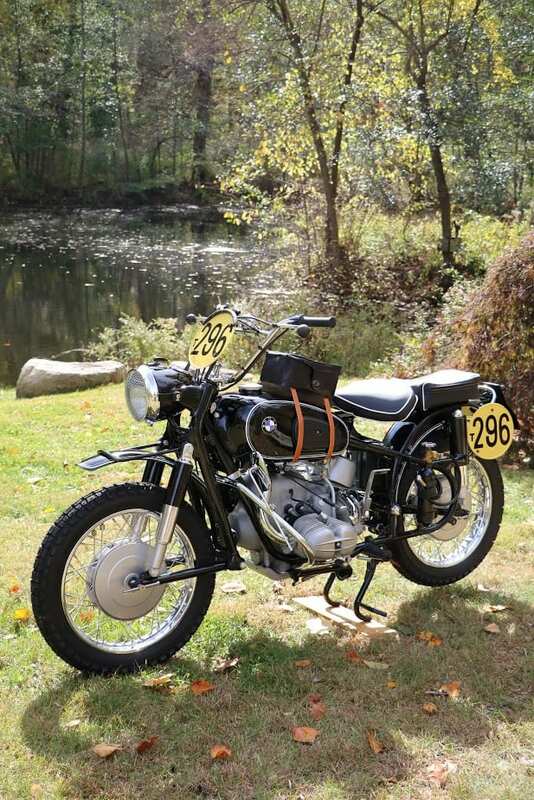 It was the last “Earles Fork” model BMW to race in ISDT competition. 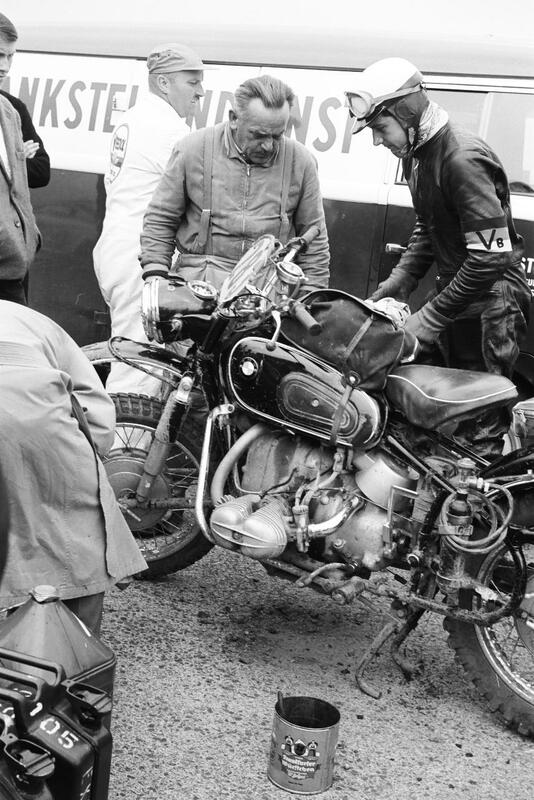 By 1963 BMW had moved to telescopic forks for ISDT campaigned motorcycles; several years before they were available to the public on the US models of /2. 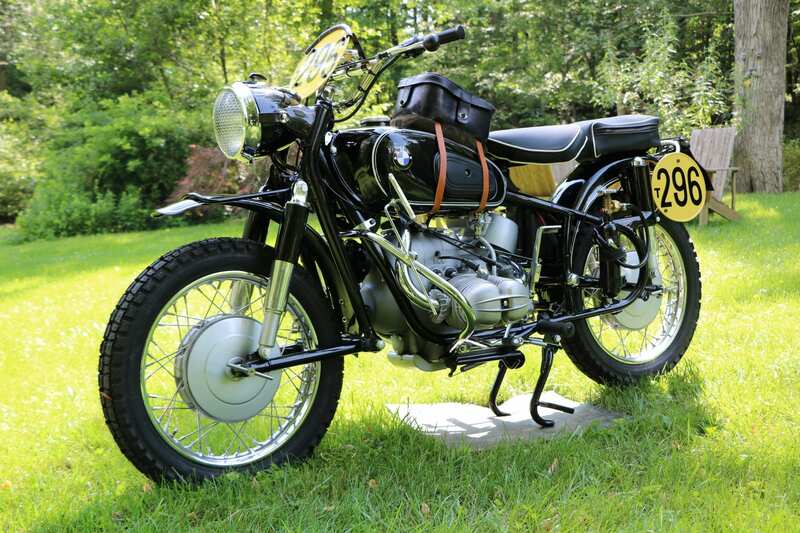 And although BMW campaigned enduro motorcycles previously to the 1960 ISDT, the success of this version was clearly an important step in the evolution of the Gelande Sport, or G/S, models to come. I was so fascinated and enamored with the configuration and story of this machine that I decided to use the photo as a guide and try to replicate it to exact mechanical and cosmetic specifications. The prospect was daunting. Could genuine parts be found? Who could possibly fabricate all the intricate custom parts and mounting systems? A journey of a thousand miles starts with one step, so I started by collecting hundreds of historical photos from books, internet searches and with the assistance of BMW Historical Archives. 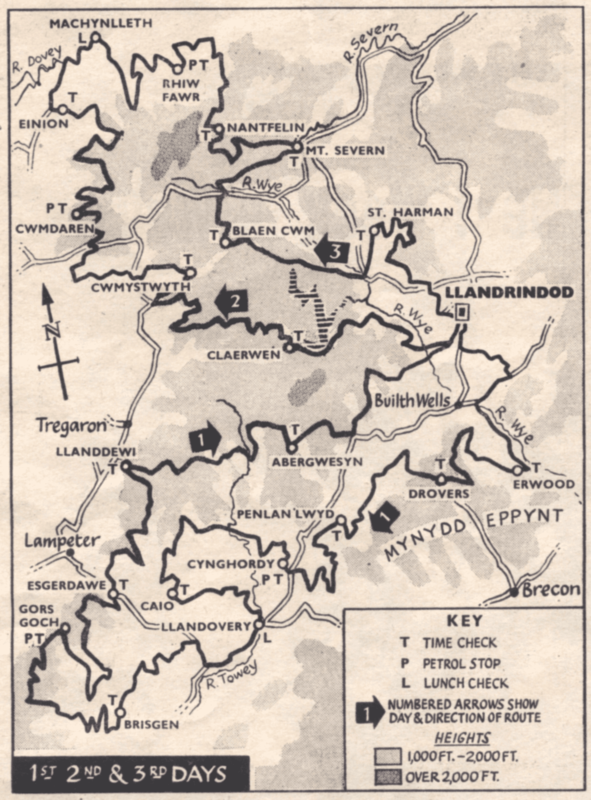 I discovered the websites Speedtrack Tales and Vinduro, both invaluable resources for ISDT history and images. 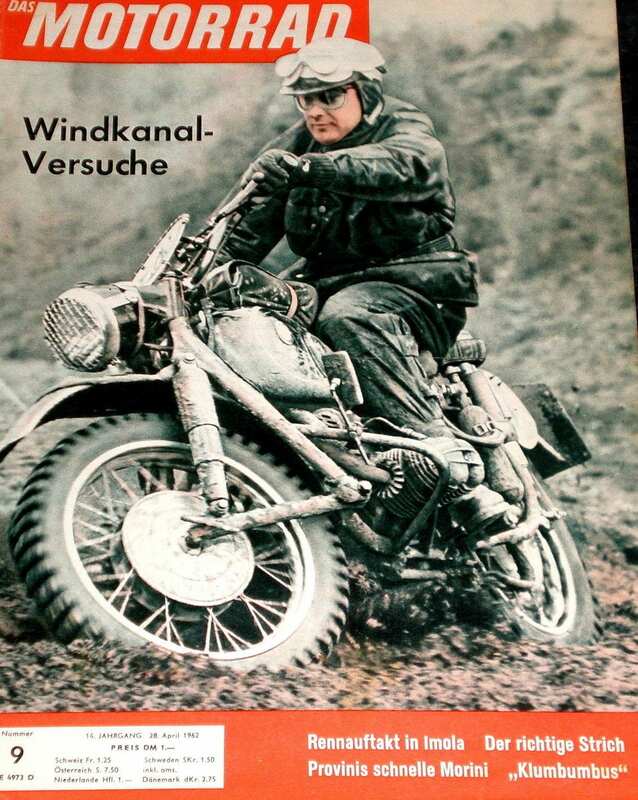 I found great photos of Nachtmann pushing the bike to the starting line, and later on the trail, blasting through water crossings, and pushing the bike through deep mud, sometimes with the help of the public. Then a stroke of luck. Fellow BMW enthusiast Mike Kowal put me in contact with German master metal fabricator Hans Keckheisen who was making parts for an ISDT bike of his own. I had read about Hans’ amazing restoration work on the famous R7 prototype for BMW, so I didn’t need much prompting to contact him to explain my project. After sending him the photos he agreed to replicate the needed custom parts with his usual painstaking accuracy. He acquired a donor R69S and stripped it down to use as a model and got to work. Then I had another stroke of luck. Sebastian Nachtmann’s longtime friend and German enduro race competitor, Rudolf Schröder, agreed to supply me with his personal photos of actual competition used race parts; the real deal. Magura super high handlebars, a leather tank top tool box and the air tank for filling punctured tubes. After many months the crate of amazing parts, or more appropriately works of art, arrived from the Keckheisen shop. Laid out on the floor they were simultaneously familiar yet foreign; somewhat like the stock version yet clearly not-at-all. 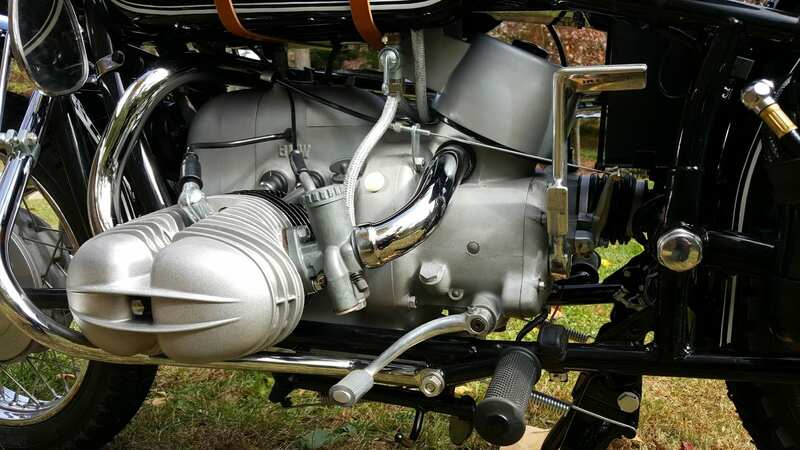 The cross-over exhaust was chromed two-into-one with heat shields and torpedo muffler. 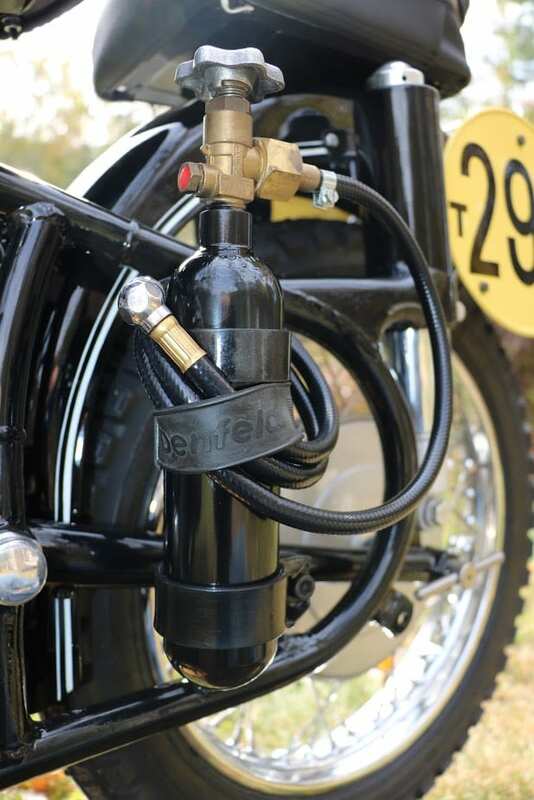 The shortened front fender had a unique horizontal support bracket for mounting to the shock bolts, and the shortened rear fender sported an early model Bosch bullet style brake light. 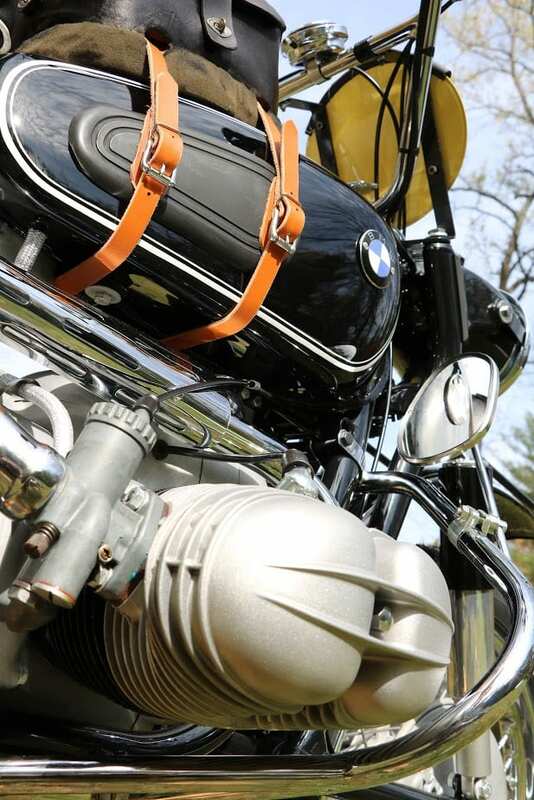 The padded leather seat cover matched the fender mounted tool bag which doubled as a seat for Nachtmann’s long frame. 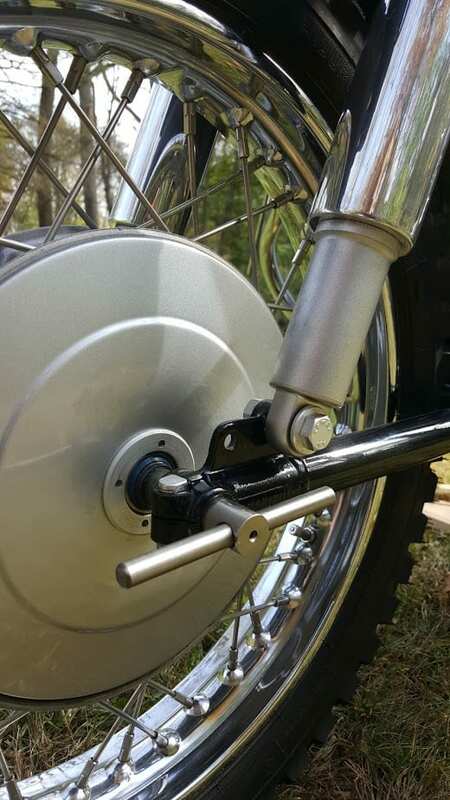 The clutch lever was redesigned and modified to point upward to avoid rocks, necessitating the routing of the clutch cable over the top of the engine. The air cleaner box port was rotated so that the intake port would face upward and had an extension to avoid going under water. Rounding out the goodies was a chromed protective grill for the headlamp lens and an oil pan skid plate. Now we were in business. 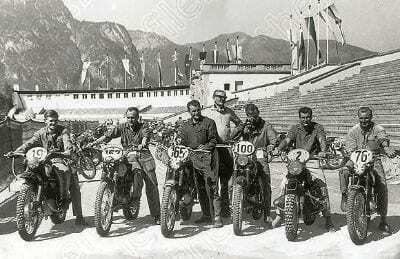 From Left to Right: #19 Erwin Schhmider 350cc NSU, Lorenz Muller 175cc Hercules, #165 Lorenz Specht 175cc Zundapp, #100 Gunter Dotterweich 250cc Maico, #2 Sebastian Nachtmann 750cc BMW, #76 Richard Hessler 250cc Zundapp. From a friend’s collection, I acquired a well-worn but complete and running original R69S and brought it to Phil Cheney at MAX BMW in Connecticut. 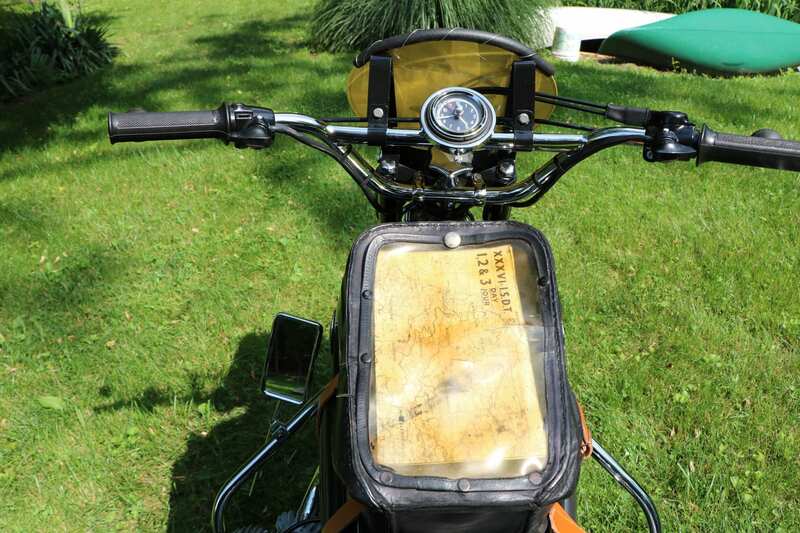 I took the stock fenders, handlebars and exhaust system back home with me and left the rest with Phil. He did a perfect “bolts off” restoration to period specifications, including a full rebuild of the motor. 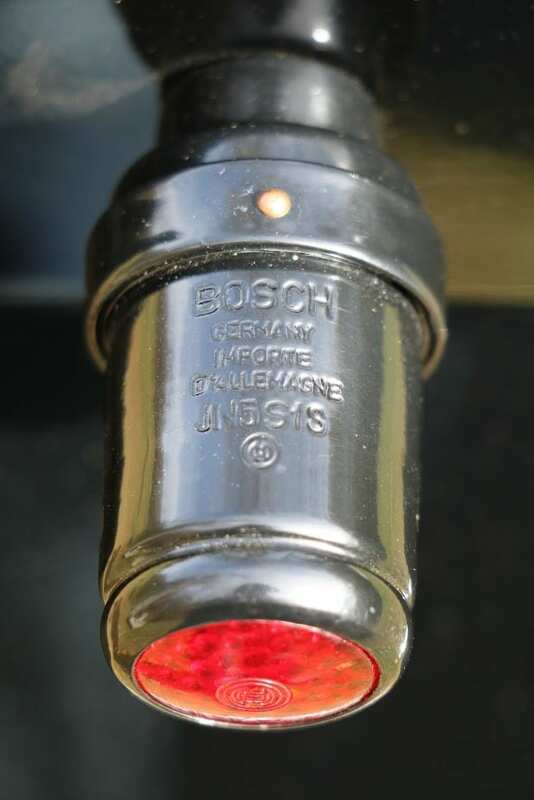 All original fasteners were used and correctly finished; parkerized or plated in cadmium or black oxide. Knobby Hidenau tires completed the look. I was then in the final stages. 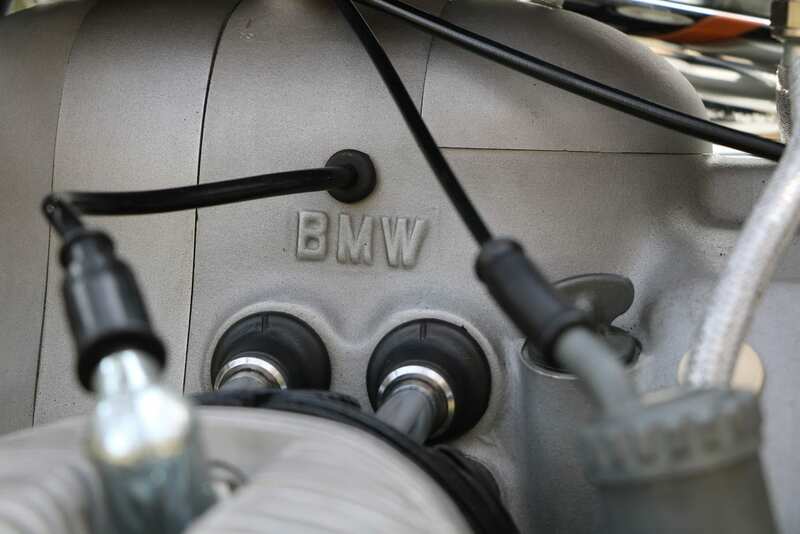 I enlisted the help of my longtime good friend, mentor, and master BMW mechanic Lou Stellar to fabricate, paint and install the required mounting hardware for the air tank, number plates, and engine guard mounted mirrors. 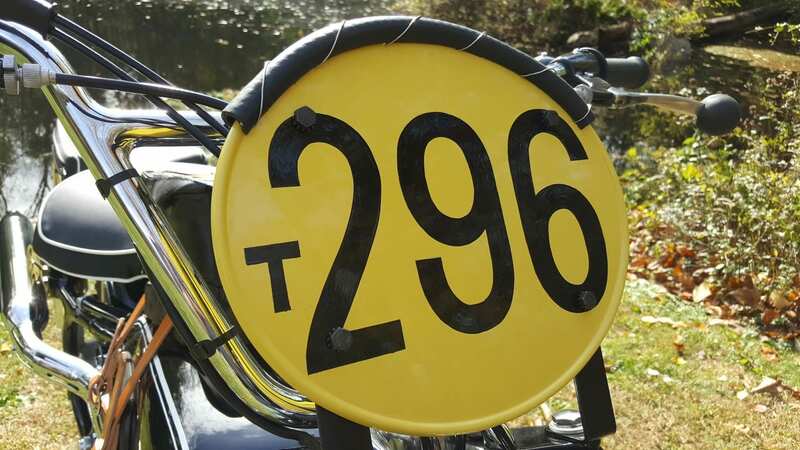 The metal number plates in FIM regulation size were painted in “gelgolb” yellow with the Nachtmann 1961 ISDT winning number, #296 , hand-painted and preceded by a “T” indicating a trophy team rider, just like the original. Lou also oversaw the restoration of the leather tank top tool box and stunning leather mounting straps. For now, I will keep it clean to ride and show at rallies, but I look forward to the first time I can use it for its intended purpose; getting down and dirty in the mud. You can read more about my R69S ISDT in the current issue of VMX magazine. Please call me ,my name is Scott lichlyter 812 683 0079.